Four and a half grand Nice big power transformer. For $4k5, I'll have plated through holes on my circuit board please or better still point to point. solder joints to replace any components. Plated through holes would allow components to be easily de soldered / removed without touching the boards. they should try a bit harder??? It looks like a Target's version of a service mans nightmare. Cheap looking valve bases, nasty caps and resistors with lots of interconnecting wiring, all a long way from service friendly and traditionly built but the PCB's reduce costs for the manufacture. Despite all this it is still being shirt salesman priced. Compare this to Far eastern products and it's vastly overpriced. They are obviously trading on the old name and hoping to attract some rich punters. They will probably argue that back in the 60's when these were first produced they were equaly priced in terms of currency value and therefor offer good value for money. Some of us know better. I also spy that the socket on the back of the amp is not even wired in which means it's a demo model. The audio game has got to be even tougher in the current climate so I applaud these guys for trying to regenerate a past icon but they really need to get into the real world and go through a redesign, ditch the PCB's and use components that do not make you want to look for a bucket. To be fair parts choices cannot be questioned without first listening to it, it could sound great as zenelectro said. The parts may have been selected to keep the original voicing, or not. I don't know this, and I'm pretty sure you don't either, so I would think it's unfair to speculate either way about parts choice, or that it could sound like sh!t (from looking at a photo of all things), in a public medium such as this? Pricing compared to the far east, well that depends where it is made, if fully assembled in the UK then I would think it's fair? Anyway, it's not far off the price of some locally assembled DACs...... perhaps they too could adopt a far east pricing model? I recently had an original 1960s Radford STR 25 mark 3, and i will say it sounded fantastic, ran 4 EL34s. It may have been the best push pull amp i have ever heard, the sum of the parts is what matters, and Radford transformers where and are brilliant, so what do they do, They are changing the materials in this new reissue and that is fraunt with danger, often it is the original materials that give these fabulous old amps the magic, Big mistake in my opinion. 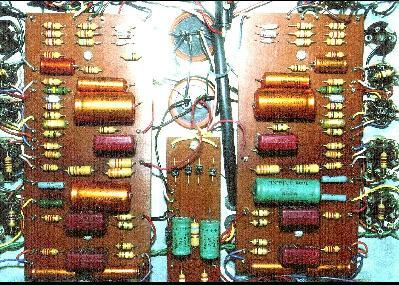 Look at audionote they changed the dielectric in there caps from paper in oil and they lost that special magic. omodo tell bill about this he might get one or post the link on sna with any luck some punter will buy,and if you wait long enough you can pick it up on sna forsale section. i would like to listen and then modd one. Yes anticipated , Now that the design is >25 years old it's out of patent so some jump on the bandwagon and produce reissues. Sum of the parts indeed. If it is all made in the UK then they have done well to constrain the price to around 5 grand, can anyone find out? I am not knocking the dedicated types that do such reissues, maybe it's even a relative of the original team. Some one please buy me one, pretty please? ? Wasn't there another build here in Australia? I remember something about a year ago? They boasted about some ridicules resistor culling of one in every 10.000 or something. I wa s wrong in the one in 10.000, they state "Our yield is only 100 in every 10,000 parts" and relates the parts in the phono section. Steven do you know of a circuit for this amp? I think they have it in the OP's link? You are probably better off building a PP EL34 amp from scratch. I can see this in your future. Thanks for link, circuit looks very simple and has some pretty unique things in it. Can't say I understand everything in that circuit (noob here), but thought the selectable output with different amounts of feedback for each, interesting. Am I right in seeing high levels of GNF in those? the FB comes from the 16 ohm tap, if you use 4 ohm tap, FB comes from that tap. It is actually a VG way to do it. I see the switching at the taps. I was just wondering about the levels of FB applied, just that I haven't seen a resistor in series with the cap in the FB circuit, without that resistor in series I wound imagine the FB to be pretty high, just that I don't know what effect that resistor in series has on the circuit. Hi, yes I made the post knowing your interest in the Radfords.. unfortunately there is only one way that prices will go on vintage audio, unless the europeans? start dumping stuff but I figure most of the collectors are in SE Asia..
high by many to be a product that was viable (if made in the UK). now, but I felt that was not right for the British pedigree of Radford. him and Will to bring the brand back to life. 'revival' is well under way with the classics that Steve and Will are producing. considering Steve's background knowledge of Arthur's winding specifications. further queries I'm sure Will can answer them. and he gave us permission to use the Radford name on these products. specifications, which we have the original copies of. with yours,and everyone else's efforts,Peter,to keep Radford British. Congratulations and keep it going!!! Sounds very promising, would love to listen to one when opportunity arises. This is also a good news for anyone who wants to replace their Radford's blown up OPTs. Thanks for the info D.
2 x 15's and a 25. We had loads of fun tube rolling on the 3 different units. Opened the amp, and the guts were very different on all of them.